The GEORGE ADAMS GALLERY is pleased to present an exhibition of figurative paintings by ELMER BISCHOFF (American, 1916-1991). The exhibition, which features 11 paintings made between 1954 and 1972, will be on view through August 14th. This New York exhibition is the first in 25 years to feature Bischoff’s figurative paintings. 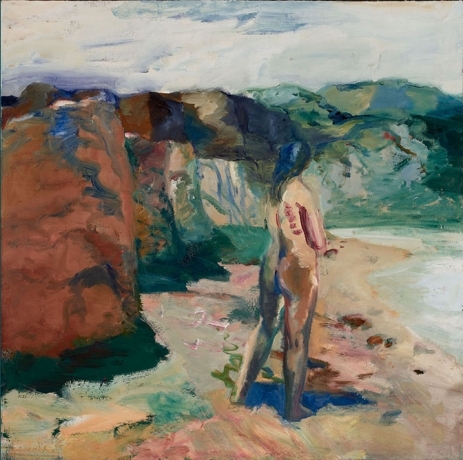 ELMER BISCHOFF is best known as a founder of Bay Area figuration, along with his close friends and colleagues Richard Diebenkorn and David Park. Characterized by rich coloration and painterly technique that borrowed nearly as much as it rejected from Abstract Expressionism, Bay Area figuration became recognized as a significant movement as a result of a survey exhibition organized by the Oakland Art Museum in 1955. That same year Bischoff had a critically acclaimed solo exhibition at the San Francisco School of Fine Art where he had just been appointed chair of the graduate program. Having previously experimented with surrealism and abstraction throughout the 1940s, Bischoff began to work figuratively in 1952, a year after Park and two years before Diebenkorn. The strong influence of Toulouse-Lautrec and Bonnard on Bischoff is evident in the earliest work included in the exhibition, “Playground,” 1954. However, By the mid-1950s Bischoff’s brushwork and palette became more assertive while his subject matter suggests close study of Edward Hopper and Edvard Munch. Included in the exhibition are three examples: “Montgomery Block,” 1955; “Woman Getting A Haircut,” 1962; and “Figure at Window,” 1966. As a final development, in the late 1960s Bischoff fell under the spell of Richard Wagner whose operas he listened to almost daily. His fascination with Wagner – and with German mysticism and mythology – accounts for the large-scale and newly cerebral qualities notable in his work of this time. 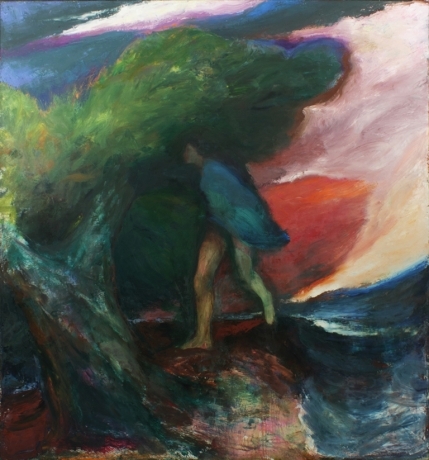 “Figure, Boat, Clouds,” 1971 and “Figure with Tree,” 1972 - the latter is thought to be the last figurative painting he completed – are among the late works in the exhibition. In 1972, after 20 years of working figuratively, Bischoff returned to abstraction. He also began working with acrylic paints and, in contrast to his figurative work, these new canvases are full of color and light. For Bischoff the shift to abstraction was liberating, but it is his figurative work that is the basis of his reputation and is still considered the highpoint of his artistic achievement.